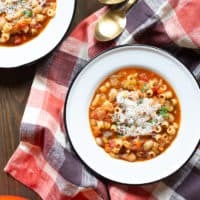 One-Pot Pasta Fagioli Recipe | Good. Food. Stories. So your arsenal of natural nonstick pans is ready to go—the cast iron’s been seasoned, the enameled Dutch oven is on the burner, the stainless steel is shining. Now what? You make a whole meal in that pan, that’s what. One-pan / one-pot / one-skillet meals have rightfully taken pride of place in the weeknight dinner lexicon. They’re almost too good to be true, what with their seductive promises of big-batch, comforting dinners with barely anything to wash after the meal. So what’s the secret? Well, the secret is that there are actually two secrets: the first, to use a high-sided skillet or Dutch oven that can hold all your ingredients with room to spare. And the second? A clever technique stolen from risotto-making that allows your starch (like rice, potatoes, or pasta) to simmer directly in the pan with flavorful broth and aromatic vegetables. 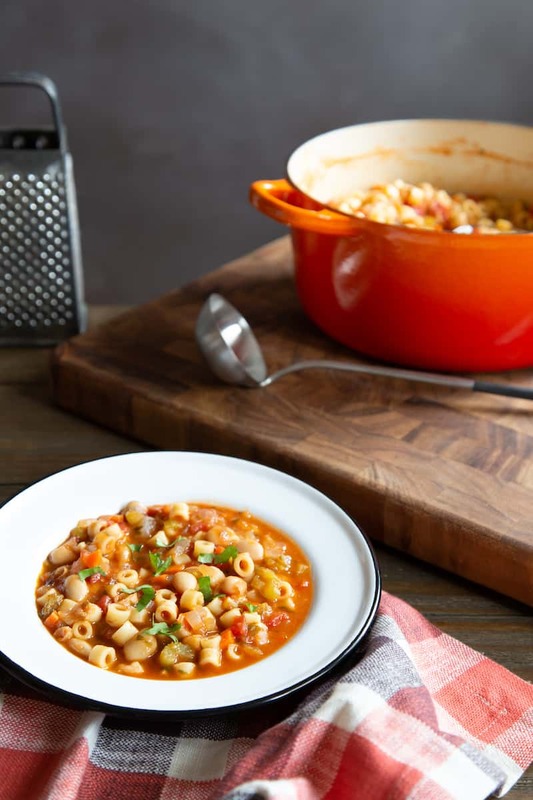 This one-pot version of pasta fagioli, or “pasta fazool,” as we refer to it in our house, is yet another variation on a classic Italian dish. Though the basic components of this soup-slash-stew—pasta, beans, and aromatics—remain intact from recipe to recipe, there are infinite tweaks and personal touches that have been added or subtracted from the meal over the years. Some cooks include carrots or tomatoes, while others eschew them. Some replace sage with rosemary or keep things simple with just garlic and parsley. 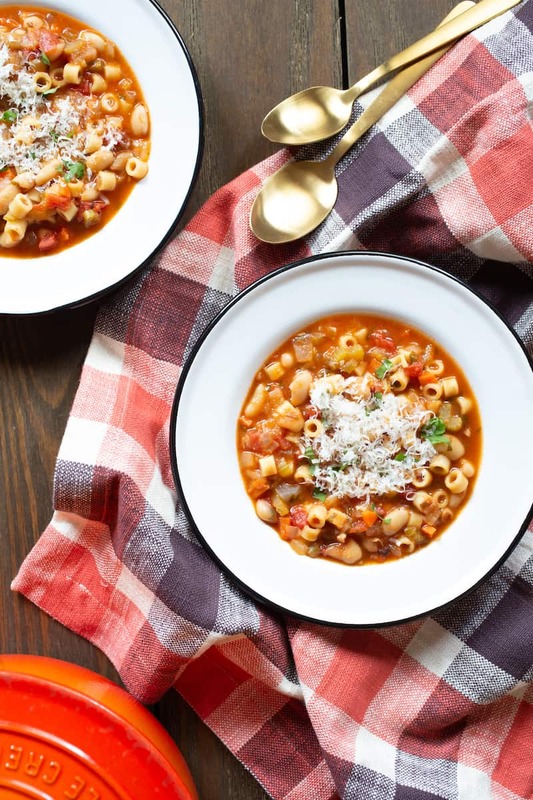 Though pasta fagioli is traditionally simmered for hours as dried white beans turn soft and plump, creating a creamy sauce, this version might make your grandma blush. I’m cheating here by using canned cannellini beans, creating a hearty and satisfying stew that cooks in less than an hour. 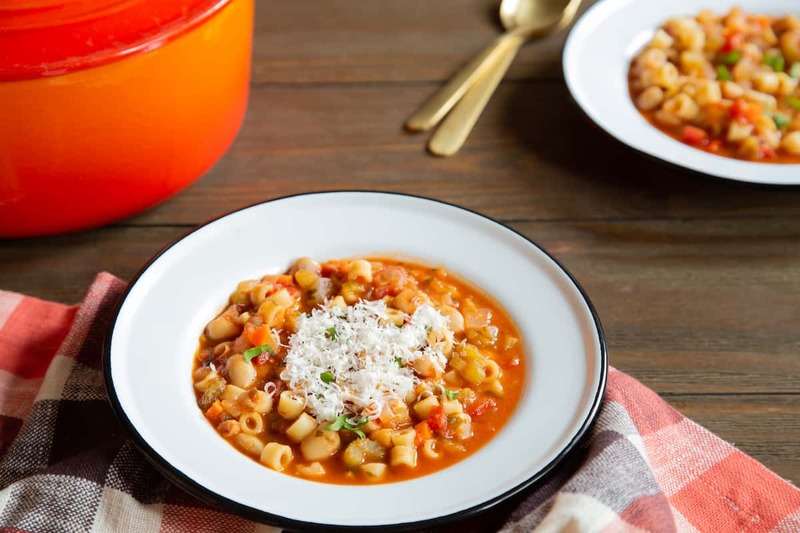 It’s just as instant as making dinner in a multicooker, with the added bonus of being able to adjust the slurp factor of the pasta fagioli to your preference. 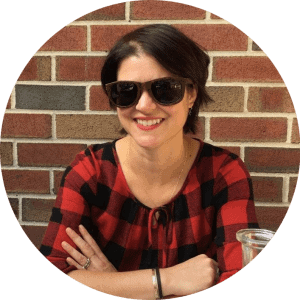 Whether you like yours to be more of a saucy pasta or a thick soup, you can eyeball it to your liking. Serve with crusty Italian bread and a Caesar salad, and you’ve got yourself a full meal. This one-pot pasta fagioli recipe with tender beans and ditalini comes together in 1 hour—but tastes like it's been simmering for much longer. Heat the olive oil in a Dutch oven or other deep, heavy-bottomed pot over medium-low heat until shimmering. Add the onion, celery, carrot, garlic, and sage and stir with a pinch of kosher salt. Cook for 10-15 minutes, stirring frequently, until the vegetables are very soft and translucent. Increase the heat to medium and add the crushed tomatoes and 2 cups chicken broth. Cover and bring to a gentle boil. Uncover and stir in the ditalini and cannellini beans. Cook for about 10 minutes, stirring frequently, until the ditalini is tender. If the consistency is not as soupy as you'd like, add as much of the remaining 1 cup chicken broth as needed and cook until warmed through. Just before serving, stir in the parsley, black pepper, and additional kosher salt to taste. Serve with grated Parmesan cheese for sprinkling over each bowl.